With a strong V-6 engine, seating for up to eight passengers, and an intuitive cabin design that focuses on function, Toyota Highlander is a top pick for a three-row family crossover vehicle. The 2016 models have an upgrade that includes a standard towing package on all V6 models. A heavy-duty radiator with engine oil cooler, 150-amp alternator, supplemental transmission oil cooler, and 200-watt fan coupling make the V6 towing package ideal for hauling a boat, ATV’s, or jet skis. Properly equipped, the Highlander has a towing capacity of 5000 pounds. With standard features like a USB port, Toyota Entune infotainment system, a 6.1-inch touch screen, Bluetooth, and a rearview camera, Highlander’s interior is equipped to handle every driver and passenger need. The dashboard controls are easy to use, with climate controls and major audio controls separate from the touch-screen. Highlander has many storage spaces inside the cabin for small items, including a center console and large glovebox. The available variable power liftgate easily adjusts to accommodate user height and different sized garages. The front seats and second row seats are easy to step into and offer plenty of room for adults. The third row seat can easily accommodate up to three children. 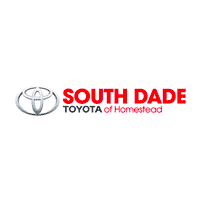 Here at South Dade Toyota of Homestead, we have a variety of new Toyota Highlander vehicles available and on our lot. To schedule a test drive, or to learn more about the Toyota Highlander features and options, please contact our customer service team.